It's time for me to go home, I was still hungry and wanted to eat something unusual. I don't want to go home and cook dinner. So, I went to the hawker just beside their HDB and look for something to eat. There is a food named Kway Chap. I thought that this might be delicious. It's a mixed type dish with pig's intestine, pork, tokwa, tofu and half egg. This costs me S$3.50 with a free Kway but without drinks. I took a picture of it for you to see. This is a little bit expensive but good enough to award myself for a week's job. 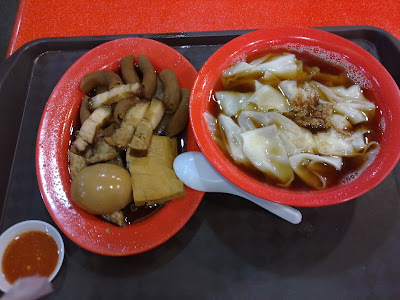 Kway Chap (left) and Kway(right) with chili inside the small container. For me, nothing beats the taste of Chinese cousine, this is what I like in Singapore. Yummy!! !